Some decisions are best made from the comfort of your own home. Choosing your next floor is no different. Allow Suburban Floors to bring thousands (Over 5000!) of hand picked samples to your setting where you can make the best possible choice in color and design. With over 20 years experience in everything from carpet to hardwood, and everything in between, we can provide you with the expertise that you need, with a personal touch. We listen to your needs and schedule an appointment that fits into your schedule. Since we bring our showroom to you, there's no need to worry about traditional business hours. Bob came out and measured. They were in my place the same week. Did a fantastic job and super great to work with. Would recommend to anyone. They showed up promptly one day after calling, gave estimate which we accepted, with upgrade of padding. They were able to start three days later and the job was done on time. It was a very positive experience overall. It went quite well. Bob explained to me the different between different types of carpet. The work is well done. Bob is quite honest and helpful. Will recommend him to friends! Perfect. Prices were half the cost of Home Depot and great quality carpets. We have had the floors for a year now and the carpets all still look excellent. Holding up to a ton of wear and tear. My highest recommendation. Bob was very professional and accommodating. His experience and knowledge in the flooring industry made picking out the carpet really a breeze. My carpeting looks awesome and it gave my house a fresh new look! The installation was done in a very timely manner and all was done neat and clean. I would and have recommended Suburan Floors to my friends and family! I have had Bob and Suburban Flooring do multiple jobs for me. Carpet in my primary residence, parents home and girlfriends home. His work, team and product are beyond compare. He hones in on the right product, he listens and makes sure to recommend the right product for my needs in each case. His team is efficient and courteous when it is time to install. The only way you know they have been there is the carpet looks so much better when they are gone!!! I will continue to use Suburban Floors over and over again. Bob handled everything professionally and showed up to all appointments on time. He took the time to educate us on the reasons why our old carpet was failing, and offered products to keep the same problems from happening again. Bob was very patient with us and gave us ample time to decide on the color of the carpet without any pressure. Installation went well. Suburban Floors worked around our ever-changing schedule and completed install within the timeframe we agreed on. The carpet looks great (now a year after install) and is performing well under the strains of our commercial application. I had them install the whole first floor with hardwood and entire second floor with carpeting. Suburban Floors did a fantastic job and they were very neat and careful not to scrape my walls or baseboards. I will defiantly hire Suburban Floors again when I redo my basement! Bob was prompt, courteous, and fair. He scheduled our flooring quickly before we were about to move into our new house. His men worked quickly and efficiently and did an excellent job. I highly recommend! Bob was very accommodating throughout the job. He worked within a tight timeframe, starting and finishing the job on time. He was easy to reach and communicated very well. The work was done professionally and efficiently. The pricing was good. 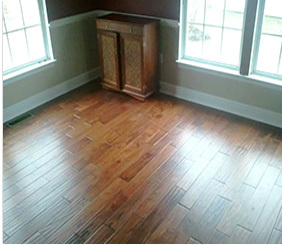 His company did a beautiful job on our floors, and the process was made easy. I would recommend Suburban Floors as they have experience and Bob provides great customer service. I called Bob from Suburban Floors, and he came out the next day to give us an estimate. He sent a sample of the color we chose and then came to the house to bring another sample. We decided on our color and Bob ordered the carpet. He came back to do the job with his crew within two weeks. They were very professional. The job took two days. They arrived promptly in the morning and cleaned up very well prior to leaving. I highly recommend Bob and Suburban Floors for any flooring needs. I would definitely use them again. They were very professional, neat and fast. I WILL use them again! Highly recommended. After contacting Suburban Floors, the owner, Bob, came to my house to discuss work to be done, materials to be used, measurements, price. He stated that materials would be ordered, and that he would notified my when that occurred. It was approximately 3 weeks before the work started. I was told that he and an employee would arrived about 8:45, and they were right on time. It took 2 entire workdays to complete the project, I was very satisfied with the materials that were used, and the work that was done. A VERY GOOD experience! We are very pleased with the installation, Bob and his crew did all that we asked and completed quickly. It was good for us how Bob helped with the style of the carpet for each room, we are glad for his help. Key take-away is that Suburban is a qualified and quality supplier, and they perform at a lower cost than major competitors ( based on home-owner estimate), by significant margin. Also, Suburban uses only Nylon carpets. Please seriously consider Suburban Floors, we are very pleased that we did! Already a Suburban Floors Customer? Looking into a new floor covering? Contact us with your project ideas and allow one of our knowledgeable staff members to help you with your choices.